When choosing an occupational therapist for a serious illness or injury, it’s important to know that you’re choosing one that has experience in handling cases like yours. We’re a group of occupational therapists who are devoted to our clients and to their well-being. We have years of experience assessing, treating, problem solving, and improving the quality of life of individuals after they have suffered a serious illness or injury. Our areas of experience include working with people who have suffered from the effects of motor-vehicle accidents, those who are elderly and are experiencing problems with their health that are affecting their independence and ability to live safely in their home as well as individuals who due to their illness or injury are having difficulty returning to their job or meeting the demands of their job. Our team of occupational therapists bring decades of experience to work with each of our clients. We are dedicated to continued learning to ensure that we are educated in the newest research and best practices in all areas that we serve our clients in the best manner possible. Our team has experts in the knowledge of senior care and illness and life problems associated with aging, pain management, traumatic brain injury and other neurological conditions, and psychological challenges. We are skilled in assessing how these illnesses and injuries lead to disabilities in all areas of life and we provide the rehabilitation to recover and help our clients get back to living better and fulfilling lives. Our services to our clients don’t end with occupational therapy assessments. 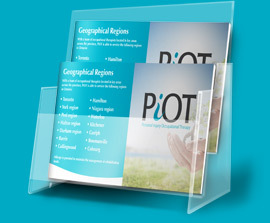 PiOT is uniquely structured to not only make occupational therapy recommendations, but to put those recommendations into action. We’ll help set up appointments with specialists, explain our plan of action to doctors, coordinate with publicly funded services, facilitate getting equipment needed and coordinate with contractors to make environments accessible, provide training to improve memory and organization skills in treatment. We do whatever is necessary to ensure that our recommendations are completed successfully. These are just a few examples of how PiOT goes that extra mile for our clients. Occupational therapy is not just about providing treatment. It’s also about us listening to our clients’ needs, and making sure we are always meeting them. It’s about working closely with our clients and their families to help navigate the complex health and insurance systems, working in coordination with their medical specialists and treatment teams to make sure we are always on the path to improvement, and coordinating with case managers, lawyers, and adjusters to make sure that they have all the information they need now and for the long term. At PiOT we’re devoted to our clients. Improvement in our clients’ lives is our main concern, and our relationships with their medical and legal teams is just as important to ensure we are reducing their burden and helping them to meet their goals. We never give up on our clients, because we know that with hard work and our support, an improved life is within their reach.